They don't think it's no big deal because they think separation isn't traumatic, they think it's no big deal because it's "not our kids" (read: not white) being traumatized, to quote Fox & Friends. And the reality is, this is what they want. The press has spread the word about the evil at the border, which people like Stephen Miller thinks will stop immigrants from wanting to come here. In hundreds of cases, Customs agents deleted the initial records in which parents and children were listed together as a family with a “family identification number,” according to two officials at the Department of Homeland Security, who spoke on the condition of anonymity because they were not authorized to discuss the process. Bullsh*t. Nobody deletes records unless they're trying to get rid of information. There is zero reason not to simply append information to records while maintaining appropriate history. Tracking cases separately is fine, but there's no reason to not have a link to the original record. And, of course, the problem with that is the horrific things they're fleeing makes it really hard to discourage refugees like that. Like, Trump from day one has been pushing the idea of "Mexicans" being the problem, but a lot of these refugees are from Honduras, Guatemala and El Salvador, where they're fleeing horrific violence. Unless the US government plans to start actively murdering people, there will continue to be refugees who choose to come here and apply for asylum (which, I should repeat, is generally agreed to be a human right). When this administration is done... can we get a “The Hague: part 2”? If only to hear most of them repeat the old chestnut of “I was only following orders”. "Guys, I've heard of this thing called 'The Nuremberg Defense', I think we should try it out." "That sounds reasonable, I mean, it was apparently developed for this exact situation, it's all in the name!" Just over half of the 100 migrant children that a US court ruled should be released from detention centres and reunited with their parents will be able to do so, a US government lawyer has confirmed. At least 54 children under the age of 5 would join their parents by the court-ordered deadline of 11 July, Justice Department attorney Sarah Fabian told a San Diego court. “My 5-yr-old client can’t tell me what country she is from,” Laura Barrera, an immigration advocate, tweeted. “We prepare her case by drawing pictures with crayons of the gang members that would wait outside her school. Sometimes she wants to draw ice cream cones and hearts instead. She is in deportation proceedings alone. Help the Feds, get deported. "I don’t know what’s going to happen if she goes to Peru," said her daughter, Urpi Ríos. "We have nothing there." The Department of Justice told a federal judge Tuesday that it may have mistakenly separated a father and toddler who could both be US citizens for as long as a year, in the process of enforcing the Trump administration zero-tolerance immigration policy. A running theme of Trump's executive orders is that they are almost universally never well-thought out and he has never really taken the time to determine little things, like if the order is Constitutional or where the money is going to come from to carry out the order. That last bit was the focus of internal budget documents from the Office of Refugee Resettlement obtained by Slate. The TL;DR is that the Trump administration never considered the cost of its "zero tolerance" immigration policy so now the ORR and its parent organization DHS are "re-allocating" funds for HIV/AIDS programs as well as programs designed to help refugees who survived torture to pay for locking children up. In the documents obtained by Slate, ORR officials describe the budget implications of a potential surge in immigrant minors over the next three months. The ORR’s budgeting exercise is premised on the possibility that the agency could need as many as 25,400 beds for immigrant minors by the end of the calendar year. The documents do not indicate that ORR officials have specific knowledge that family separations will increase but do show that the agency is preparing for the possibility. The internal documents estimate that if 25,400 beds are needed, ORR would face a budget shortfall of $585 million for ORR in fiscal year 2018, which ends on Sept. 30. Under this scenario, that shortfall would increase to $1.3 billion in the first quarter of fiscal year 2019, adding up to a total shortfall of $1.9 billion for the period between Oct. 1, 2017, and Dec. 31, 2018. The documents stress that these budget estimates represent maximum possible expenditures and that actual expenses may be lower. The Department of Health and Human Services did not respond to multiple requests for comment about these figures or anything else relating to the documents. To help cover these potential costs, the documents say, HHS will seek supplemental appropriations from Congress. The documents also indicate that HHS plans to pay for child separation by reallocating money from the Ryan White HIV/AIDS Program, which, according to its website, “provides a comprehensive system of care that includes primary medical care and essential support services for people living with HIV who are uninsured or underinsured.” Per the documents, the process of transferring those HIV/AIDS funds has already begun. In addition, HHS plans to reallocate $79 million from programs for refugee resettlement, a move that could imperil social services, medical assistance, and English language instructions for refugees in the U.S., as well as programs for torture survivors. The internal budget documents show that ORR is planning on having to house an additional 9,000 children over the next month. Former ORR employees have noted that the agency had $1.3 billion budgeted to care for unaccompanied alien children this year. Now the agency is asking for an additional $1.3 billion for the last fiscal quarter of the year. Other former ORR officials have noted that those costs are likely to increase because in spite of the recent court order to keep children detained for only 20 days, the average length of detention for children under Trump was hitting 55 days. Additionally, those former officials warned that ORR shelters were specifically set up to care for children for the shortest amount of time possible and aren't designed to care for children who will be detained for months and months. The thing that gets me is that they could totally just let them go. Many of the people being detained now would have, in previous years, been released and told to come back for their immigration hearings. And they would (and did) show up for the hearing, because they could trust that the US government wasn't waiting outside the court to kidnap them and steal their children. Then the courts give them a mandatory deadline which they fail to meet because no one really planned out this snafu because the people in charge just wanted to scare foreign children and thought that could substitute for actual immigration policy. It’s like that saying about if all you have is a hammer every problem looks like a nail. The only tools Trump knows are cruelty and revenge and flattery. Guess which ones he uses on people who are different from him. Always. So this just popped into my feed and I definitely had a "mind blown" moment. 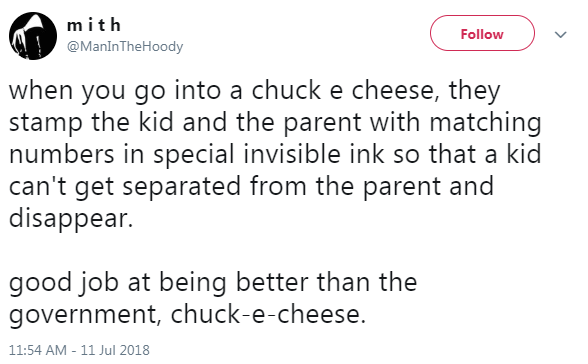 I take my kid to Chuck E. Cheese about once a week and I can't believe I didn't think of this sooner. It's almost like Chuck-E-Cheese doesn't want to abduct children never to be seen again, and the Trump government can't say the same thing. But the ink won't last very long, maybe the government could use tattoos. ProPublica: Immigrant Shelters Drug Traumatized Teenagers Without Consent: Whether they came to the U.S. alone, or were forcibly separated from their families at the border, despondent minors are often pressured into taking psychotropic drugs without approval from a parent or guardian. (SANTA ANA, Calif.) — Wet and muddy from their trek across the Mexican border, immigrant children say they sat or lay on the cold, concrete floor of the immigration holding centers where they were taken. CNN: Trump's immigration policies were supposed to make the border safer. Experts say the opposite is happening. (CNN)Before US immigration authorities detained him and took his son, the Honduran migrant said he spent three days in the hands of armed men who identified themselves as members of the Gulf Cartel. Christian, who did not want his full name used, said he was traveling to the US border with his 7-year-old last month when the men stopped a bus full of migrants in the northeastern Mexican state of Tamaulipas. The demanded $300 from each family. "They told us if we didn't pay that they were going to kill us," recalled Christian, who said he was freed three days later after relatives wired money to his captors. "There were 30 of us. There was another building next to where we were being held and they said there were even more people there." This is a horrifying failure on so many levels. The shop owner turned her in. There is no place in hell too hot for people like that. The shop owner probably feared jail time for aiding and abetting. Yeah, it is a sh*tty thing to do, but generally I don't begrudge people that have everything to lose by not cooperating. That is their life on the line, too. Him following the rules meant that he and his fellow Cubans got special consideration when immigrating as well as oodles of taxpayer funded bennies like welfare, Medicare, free English courses, and scholarships and low-interest college loans. Funny how most of these refugees are following the rules but are still getting locked up and separated from their families. It's almost like the "rules" thing is just an excuse. But a convenient one, because people like the shop owner can still sleep at night, secure in their belief in (the appearance of) law and order.